Coltin Moseman bring a variety of attributes to the attack position. The senior at Ballston Spa High School (N.Y.) has an outstanding overall knowledge of the game and excellent field vision as well as the ability to create on offense whether off the ball. shooting or passing. Moseman has found what he thinks is the perfect college program to exhibit those skills and excel as a student: Limestone College. 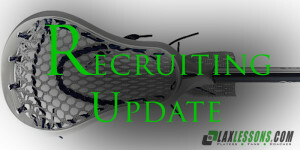 Moseman’s commitment was first reported by Joe Lombardi on LaxLessons.com’s Lacrosse Insider premium coverage section. Moseman plays travel lacrosse for Team United. You can watch the 6-foot-1, 195-pound righty’s highlight reel here. Now, here’s a Q&A with Coltin on his commitment. Limestone’s dedication to lacrosse on and off the field was a key factor in my decision I was very impressed how (Limestone Head) Coach (J.B.) Clarke and his staff ran practices. Just as important was the success of the lacrosse program at Limestone. That fact that it’s a smaller school size and teacher–to-student ratio were also key reasons to attend Limestone College. St. Michael’ss (Vermont), Mercy College, Chestnut Hill and Dowling. I feel my style of play is more of an off ball inside and outside scoring threat. I feel there is always room for improvement in all areas of the game. My main focus in the off season was to increase my speed and strength along with my continued skill development. My first experience with lacrosse was at the Ballston Spa Lacrosse Camp coached by Kevin Dayton when I was in third grade. Other sports I played during my career were basketball, football and indoor track and field. The last two years I played on Team United out of Albany. Prior to Team United, I played five years with the Albany Power program. I have played in multiple showcases throughout the country which included Top 205 East, Top 205 in Delaware, and Under-Armour all American tryouts. I would like to send a special thank you out to these people for their efforts in helping me to reach my goal of playing college lacrosse: speed and agility coach Steve Hart, Michael Gargiulo, my high school coach Joe Pollicino, and special thank you to my Team United coaches, Coach (Scott) Marr, Coach (Liam) Gleason and Coach (Steve) Carcaterra, and to my parents for their support throughout the years.